The International Monetary Fund said it estimates the total Dubai debt at around $86 billion, not including what it terms ‘bilateral bank loans’. ‘Bilateral lending is a bigger concern to us since the scale of lending could be very large and data is practically non-existent,’ the bank said in an annual report. The IMF also repeated its stress on the importance of the operational restructuring of the Dubai Government owned entities at the heart of the debt problem, and said it thought the process would take ‘sometime’. In raising a red flag on ‘bilateral bank loans’ the IMF is making an important point. This explains much higher debt estimates such as $170 billion from EFG Hermes. Clearly the larger the debt the bigger the drag on recovery prospects for the UAE as a whole. Late last month the IMF revised its estimate for UAE GDP growth down from 2.4 per cent to near zero. For this to improve the IMF says the Dubai World debt restructuring would have to be concluded more quickly than expected, or the real estate sector recover, or Abu Dhabi spend more. Presently the uncertainty over the Dubai World debt rescheduling is the main block to improved confidence in local financial markets. It is also a very real block for the many businesses in the UAE owed money by the Dubai World subsidiaries Nakheel and Limitless. An early resolution of this matter is certainly far from impossible. The 11th hour Nakheel bond repayment in mid-December came completely out-of-the-blue when most observers had given up all hope, and the international press had Dubai sinking under the weight of its debts. 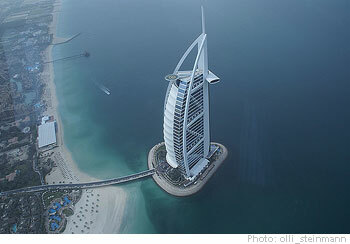 Abu Dhabi could also decide to spend more in a difficult year for the UAE. Its $2.5 billion bailout of Aldar Properties bodes well for a few more surprises. Far less likely is a pick up in the local construction and real estate sector where the supply of new property is overwhelming falling demand. This remains a challenging year for the emirates. UAE bank full-year results for 2009 are in line with expectations, and feature substantial write-offs for the Algosaibi and Saad groups in Saudi Arabia. But the big gorilla in the front drawing room of course remains bank write-offs for the Dubai real estate crash. Dubai World may have declared a $22 billion debt restructuring that brought negative headlines around the world from November 25th to mid-December last year. But Dubai World debt has not yet actually been classified by any UAE bank as non-performing. That said, the Emirates NBD results showing a nine per cent fall in annual net profits to $897 million for 2009 did include the bank’s first write-down against Union Properties, Dubai’s second largest property developer that is partly owned by the bank. But $86 million is unlikely to be the last write-off against Union Properties. The largest bank in the Gulf States said sovereign debt accounted for 22 per cent of its $58.3 billion loan book, or $12.8 billion of which analysts attribute the majority to Dubai Government related entities including Dubai World. Provisions are guided by the UAE Central Bank which is strict in demanding that non-performing loans be recognized according to international accounting standards. If such losses arise in the course of 2010 then it will be the accounts of this year that take the biggest hit. Nobody really knows how large total losses from the collapse of the Dubai property boom will prove to be, or the size of ‘bilateral bank loans’ and there are also non-performing loans in the northern emirates and Abu Dhabi as well. However, to talk as some of the popular local media likes to do of a quick recovery in the UAE banking sector is clearly very premature. The full extent of the problem facing the sector in 2010 has not even be finalized, let alone resolved. In the early 1980s, which government ministers have started to cite as a model for dealing with the current situation, several UAE banks went through hurried mergers and reorganizations as the true extent of bank finances became apparent. A similar local banking crisis in the aftermath of the recent real estate crash and global financial crisis therefore seems probable.